While I absolutely love my iPad, the touch-screen keyboard isn’t very useful if you’re trying to do “real” work. So when I heard about Griffin’s new Wired Keyboard for iOS Devices, I jumped at the chance to try one out. Now it might seem odd to be reviewing a wired keyboard in an age where pretty much everything is wireless. But having had less than stellar experiences with Bluetooth keyboards in the past, I was all about a reliable wired keyboard that was truly plug-in-and-play and that’s exactly what I got. 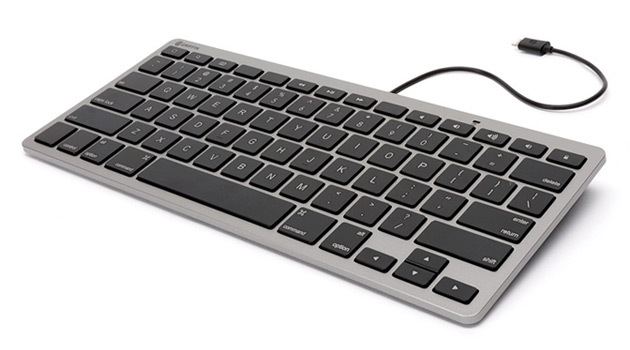 The Griffin Wired Keyboard is exactly as it sounds, a wired keyboard that plugs into your iPad (or iPhone or iPod Touch) through it’s Lightning or Dock Connector. There’s no batteries to contend with, no syncing issues, it’s honestly so simple that my 85-year old grandfather could use it! While Griffin is marketing the Wired Keyboard for schools, it’s actually really useful for business travelers like me. You know when they tell you to put your devices in Airplane Mode? Yeah, that disables your Bluetooth. But with a wired keyboard, you can continue typing away to your heart’s content. I found the layout of the keyboard to be perfect, and the tactile feedback of the keyboard is second to none. It’s 1-meter cord gives you more than enough room to work with, and since there are no batteries to replace, you’ll never get stuck in a lurch. Overall, I was beyond impressed with the Griffin Wired iOS Keyboard, and I highly recommend it to anyone looking for a quality keyboard for their iPad. While it’s not exactly cheap at $59.99, I’m telling you, it’s well worth the investment!